VANCOUVER'S CHINATOWN MILLENIUM GATE, located on East Pender Street between Taylor Street and Shanghai Alley, should not be simplified as a decorative structure built to exoticize Chinatown and to entice tourists: its complexity lies in how it marks the history, territory and development of the Chinese Canadian community in Vancouver. The 15-metre gate, designed by prominent Vancouver-based architect Joe Wai, is the result of much research through hundreds of books on the architecture of gates. The funding for the Millennium Gate was first publicly announced in February 2001, and is one of the primary projects in the Vancouver Agreement¹. The Millennium Gate came about through funding from the City of Vancouver, the federal government, the B.C. provincial government and private donations. Wai explained that the design refers to the structure of classical Chinese gates, but was constructed with very “contemporary materials”: concrete, fibreglass and aluminium-based ink. Wai said the materials were carefully chosen for their higher physical durability and lower need for maintenance. Fibreglass and aluminium-based ink, for example, can retain its brightness for at least five years. The Millennium Gate officially opened August 1, 2002, two months before the scheduled date, to accommodate a visit to Vancouver by Prime Minister Jean Chrétien. Kelly Ip, Vice-President of the Vancouver Chinatown Millennium Society, said that the opening was a great success; more than a thousand of the general public attended, including many representatives of government, despite the fact that the sudden change of schedule was sent through email. Ip admitted that the opening date, its particular time of opening, the gate’s structural design and the materials used were greatly influenced by the free consultation of feng shui master Joseph Wing Kwong Ip. The only flaw (for lack of a better word) on the opening date was that the gate was not fully completed: the two lions that now sit in front of the two middle pillars were not yet in place, and the aluminium-based Chinese characters were temporarily substituted with vinyl lettering. Neither omission deterred Chrétien from praising the Millennium Gate as “opening a door to a new future [and] to a more vibrant community.” This crossing over into a “new future” for Chinatown had a ticket price of $1 million. IN THE MINDS OF MANY CHINATOWN RESIDENTS BOTH PAST AND PRESENT, CHINATOWN IS SEEN AS MONOLITHIC AND HISTORIC – A LARGE MUSEUM OF VANCOUVER’S PAST – OR AS WAI DESCRIBED IT, A “HOLY” SITE MANY CONSIDER TOO SACRED TO TAMPER WITH OUT OF FEAR THAT ITS VALUE, BEAUTY AND MEMORY MIGHT BE COMPROMISED OR LOST. Yet ever since the beginning of the gate’s construction, there have been constant negative comments about the number of pillars used, their placement in relation to the thoroughfare and about how the pillars (in essence, the gate) could potentially congest traffic. There was even some concern that the placement of the structure could increase the occurrence of accidents. Wai replied humorously, “Those who [have] said that, should see a doctor.” He explained that the dimensions of the gate are proportionate to its surroundings. The number of pillars was based on Wai’s research into the history of other similar gates throughout North America, and of classical Asian gates, whose architectural principles require using a minimum of four pillars. The literal (and conceptual) definition of “gate” requires a flow of traffic in both directions; it is fitting that the Millennium Gate’s expanse is across two one-way streets, as opposed to along the side of a street. In addition to the research and discussions between Wai and the project manager, surveys were conducted by city engineers, B.C. Hydro, Translink and the fire department to determine how to best avoid any inconvenience to the flow of car and pedestrian traffic – all before final approval was given. The resistance to the gate is partly the result of a still-dominant idea of what Chinatown is. In the minds of many Chinatown residents both past and present, Chinatown is seen as monolithic and historic (in the sense of being a large museum of Vancouver’s past) – or as Wai described, a “holy” site many consider too sacred to tamper with out of fear that its value, beauty and memory might be compromised or lost. What is not immediately clear is why this particular corner was chosen for the Millennium Gate. Many have supposed that the location marks the edge of Chinatown. Wai revealed that the gate’s location has historical significance as the location of the “Old Bamboo Gate,” a Chinese arch built in 1936 in honour of Vancouver’s Golden Jubilee. 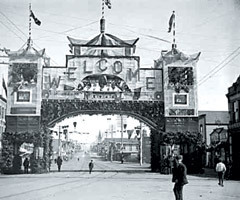 Additionally, Vancouver’s Lions Club had brought a similar gate proposal to the city 20 years earlier which had been turned down for unknown reasons. Despite the challenges of building this historically-significant gate in such a politically-charged community, Wai said with much pride that it had been a great pleasure to work with such a diverse team, who although from totally different professions were able to focus with a good spirit on realizing the project. Born in Hong Kong, Sally Lee now calls Vancouver her home. She is a Visual Arts student at the Emily Carr institute of Art and Design. This article appears in the RicePaper 8.1 Technology issue.